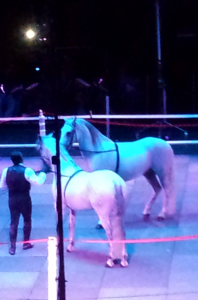 This last weekend, my husband and I were able to go see the The Gala of Royal Horses at the American Airlines Center. Talk about some beautiful horses! These were the horses rode and used by the royalty of the world. In the days before cars, these breeds were the Cadillacs and Mercedes of their day. The Fresians of the Netherlands, the Andalusians from Spain, the Lusitano from Portugal and of course the spirited Arabian were all in the show. I have always envisioned Raneous, my flying horse, as an Andalusian so its always so fun to see them in real life! Of course, they had them doing tricks like bowing to the crowd and lying down with their rider, but the best part was the military segment where they demonstrated some of the moves these giant horse were trained to perform during a battle. These horses could inflict some serious damage with their hooves! Unfortunately, modern weapons have rendered them outdated… or maybe they are truly fortunate since now they don’t have to be brutally killed in battle!